I think the first time I drove out west was the summer I was five. I, obviously, was not driving, but plunked in the back seat with my little sisters and a colouring book and some old physiology exams to draw on. My family went camping in the summers, and that year we were heading for the Rockies. Three vivid memories of that particular trip have stayed with me, and they’re all landscapes. One is eating our sandwiches by the roadside. The dry wind blowing. Foxtail grass growing on the gravelly shoulder. It was scratchy. And knapweed, with its purple flowers. Also scratchy on little bare legs and sandalled feet. The wind was cold, and it seemed to be blowing across an unending sea of dry grass. I did not like the prairies, I decided at that point. They were cold and windy, gritty and prickly, and aside from Drumheller, which had badlands and dinosaur bones, boring. But the land and sky both seemed to go forever and the horizon was so distant as to be unreal. A second memory of that landscape is a river in national or provincial park in Alberta. (I don’t know which one.) What I remember is a tangle of interlacing streams, broad and shallow, flowing over rounded pebbles bigger than my fist. The water was rippling, restless, and I thought it was so shallow I could probably wade right across and into the forest beyond. A slightly older self would have tried it. The third, which comes chronologically before the above river, is looking ahead out the windshield — I must have been in the middle of the back seat — and seeing mountains beginning to rise over the horizon. They were low, and sharp, and purple, almost translucent, nearly lost in the sky. I remember this not so much as the actual landscape I saw, but because it so struck me I tried to draw it. Purple was the right colour for the mountains, which really seemed strange — mountains are stone and stone is supposed to be grey, when colouring and for the first time I really saw, and tried to draw what was there rather than some accepted iconography of how things are “supposed” to be. The mountains were a dim and hazy purple. And so low. But they climbed higher as we drove. Oddly, I don’t remember them as anything more impressive later. It was that first sight that stuck with me. The landscapes I feel most at home in are places of hills and woodlands and brooks where the soil is a skin worn lightly and the bones of the land thrust through. But vast, far horizons and mountains continue to fascinate me, so when I came to write Blackdog, and it drew to it the landscape it did, that old sense of wonder at the endless sky and the sea of grass and the mountains slowly climbing into view came into it. What ties all those landscapes together? 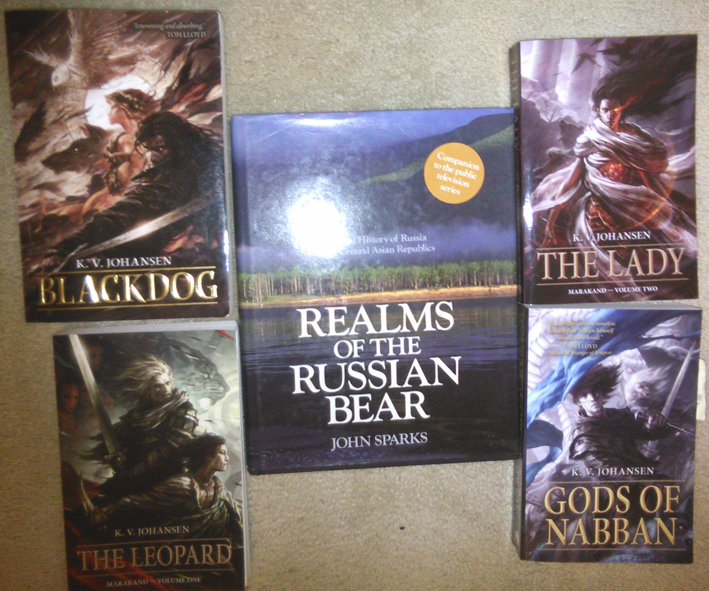 Realms of the Russian Bear, one of the godparents to the novels of the caravan road. The silk road did, more or less, if you count all the tributaries feeding it, rivières to its fleuve. That’s not a good metaphor, I know, since a river only flows one way and the current of a road flows both. Nonetheless, there it is. Holla-Sayan’s road runs from the kingdoms of the north to Nabban in the east, with threads running off to the fallen empire in the west, to the winter-dark forests of Baisirbsk, carrying goods — and stories, and people — to and from ships that sail between the Five Cities and the ports of Nabban, the continent to the south that you haven’t seen yet, and Pirakul in the farther east. The silk road brought me right back to Holla-Sayan and his caravan, following the road through desert and grass, with mountains edging their horizons. Must have been what I intended all along. Hwaet! I’m starting a series of eight or so blog posts (which may appear somewhat erratically). This here is the first of them. Each is going to take a question of the sort that people seem to want to ask and ramble on about it a bit. I’m thinking of this as “Informal interview with self.” I shall speak aloud, virtually, with enthusiastic hand-waving. Just imagine all that. As I’ve said elsewhere, outlines kill stories for me, so I generally avoid them like the plague, and I don’t start a book with any kind of coherent “This is a story about X” idea. What starts a story off for me is generally a character in a situation, and the situation is always one that has some setting attached. It expands — explodes, quite often — from there. Anyway, that was where it began. Man possessed with a battle going on. “Why?” is the question that makes the story happen. “Who is he?” that’s another one, and “What happens next?” but why most of all. Everything else unfolds as I try to find out. Holla-Sayan — that was his name, after about sixty seconds of being named Holly after my then-computer, which used to declare, “Emergency, emergency, there’s an emergency going on,” in Norman Lovett’s voice just before it crashed, which it did frequently — was one of those story seeds that exploded into vast life and a full personality almost instantly. It’s rather like falling in love or getting hit on the head. Bang. Wow. There he is. He was also obviously not the start of the story. I don’t remember thinking up the Blackdog, the dog-spirit guardian of the incarnate child-goddess Attalissa. It just — was. 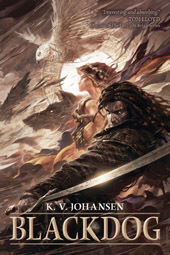 So then I went back and I started writing the story at the beginning, with the conquest of the goddess’s town of Lissavakail. Holla-Sayan comes into it at the point where he needs to be, which is slightly against the rules, because there’s this other man at the start who’s obviously the hero and then . . . he’s dead. Sorry. That’s how it happened. But anyway, there was Holla-Sayan, a decent man, if at that particular point a bit gloomy and sulky, since the woman he had a sort of a thing with in this town has gone off and married someone else. Also he was trying to be properly put out about it and get drunk and some damned horde of wizard-led warriors from the Great Grass invaded and began trashing the place. And tried to steal his horse, which wasn’t even his, he’d borrowed it from a friend. So that didn’t end well. Not for the person stealing the horse. He does what he can to help with the defence and then takes off, the locals having been pretty clearly defeated and he has a caravan and his boss — who is also his other girlfriend — to get back to. And on the way, among the refugees, he finds a child with a dying dog. And nobody is helping her, nobody is gathering her up to take her along. So he does. He was adopted himself. He doesn’t ride past abandoned children. And that changes the course of his life, and the course of his world. I didn’t think of any of that in any conscious way. It just all happened. But once the words flowed out for that much of the story, everything else about the world began to fall into place around those figures and the situation they were in. Holla-Sayan, unwilling host to the shapeshifting dog-spirit called the Blackdog and Attalissa the child-goddess herself took to the caravan road, leaving a conquered town in the mountains behind them. And the caravan road, it turned out, was going to run through almost everything in this world. 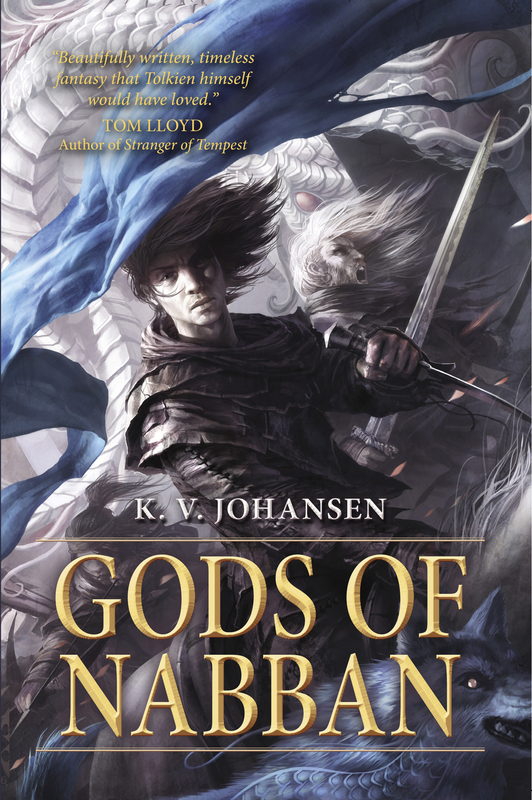 Gods of Nabban is out from Pyr and I forgot to mention this fact on my own blog. Here’s a link to my website page about it. 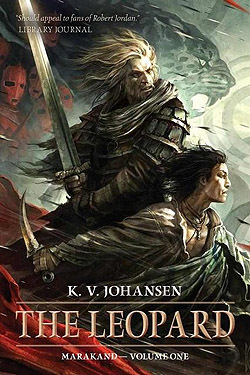 And the cover, by Raymond Swanland.